Cavazzola, actually Paolo Morando, Italian painter in Verona. He was an assistant to Francesco Morone. 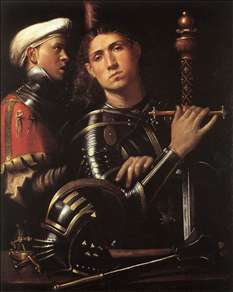 He moved stylistically between Bellini (imparted by his tutor) and the Lombards ( Foppa, Solario). Orientation towards Mantegnesque models in his composition, and also towards Raphael in later years, can be observed. See more details about "Warrior with Equerry"